LAKE MARACAIBO, Venezuela — The wildlife of Venezuela, one of 17 countries that account for 70 percent of the world’s biodiversity, has come under new pressure in addition to deforestation, toxic oil spills and illegal trafficking: human starvation. The economic crisis that began in 2014 with the collapse of the nation’s oil revenues, has now deepened to the point that Venezuela is considered a failed state by some analysts. Poverty currently holds more than 80 percent of the population in its grip, according to studies by four Venezuelan universities. Although the national government officially denies the severity of the humanitarian emergency here, public services, agricultural productivity and even the commercial transportation network have deteriorated — and as a consequence, so has access to food. As a result, people are feeding themselves wherever, and on whatever, they can. That has come to include wild animals such as the Guiana dolphin (Sotalia guianensis), locally known as tonina; the Caribbean pink flamingo (Phoenicopterus ruber); several threatened sea turtle species; as well as wild donkeys in the Lake Maracaibo estuary, once at the heart of the nation’s oil production. Likewise, Venezuela’s zoos, which suffer from a lack of vital supplies, and have reported the theft of animals, believed to have been stolen for food. Few arrests have been made for these environmental crimes, with perpetrators given minor penalties or fines. Three young men who slaughtered a wild donkey, for example, and sold its meat, were sentenced to report to a court every day for 30 days; two others found guilty of hunting 60 protected birds for illegal sale as food were ordered to perform community service. 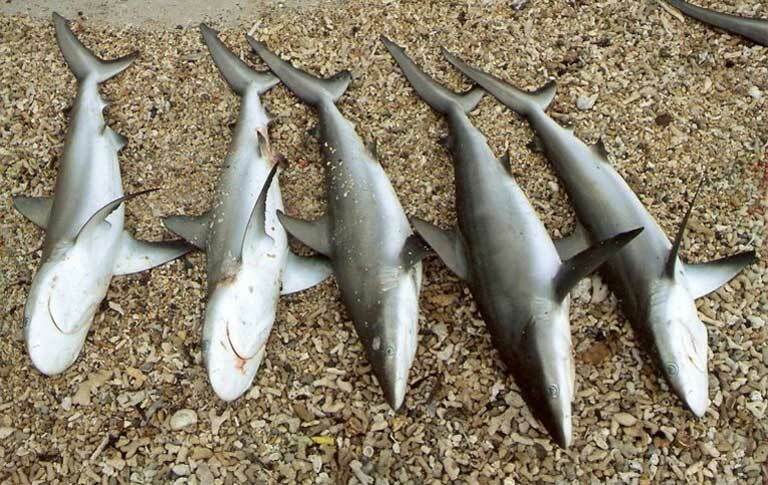 Sharks harvested in Los Roques National Park. Sometimes dolphin meat is used for bait to catch the sharks. Image by Rafael Tavares. The harshness of Venezuela’s sociopolitical crisis is transforming the relationship between humans, wildlife and habitat, sometimes in surprising ways, says biologist Drai Cabello, president of the Civil Association for the Conservation of Venezuelan Biodiversity (ConBiVe). He cites a report from a rural state market near El Ávila National Park, where hunting for wildlife has decreased not due to the lack of need, but due to the cost of ammunition: “It is cheaper to buy mackerel or sardines than the cost of cartridges to kill paca” — a large rodent, Cuniculus paca — “and deer, which also require long night hours for hunting,” Cabello says. He warns, too, that Venezuela’s ongoing gasoline shortage — ironic in a country with among the world’s largest oil reserves — could lead to a loss of habitat and an increase in deforestation, as people cut down trees for firewood. But as the crisis worsens, what they will cook is hard to say, with many state markets now closed because they no longer have food to sell. Lawyer José David Muñoz, of the Association for the Defense and Protection of Animals (Asodepa), has worked on numerous court cases involving wildlife sale and consumption. He feels Venezuela’s wildlife laws are insufficient for protecting animals from hungry people. He also regrets that a Domestic and Captive Wildlife bill was rejected in 2010 by environmental groups, who said then that their input was omitted in the legislation. That bill’s failure left the rules of an outdated and ineffective criminal code in place. As a result, he says, poaching cases aren’t prosecuted with vigor or with adequate penalties. But in a country beset by one of the highest homicide rates in the world, where food riots are a common occurrence, many Venezuelans likely would find it hard to get tough on those who are eating wild animals just to survive. 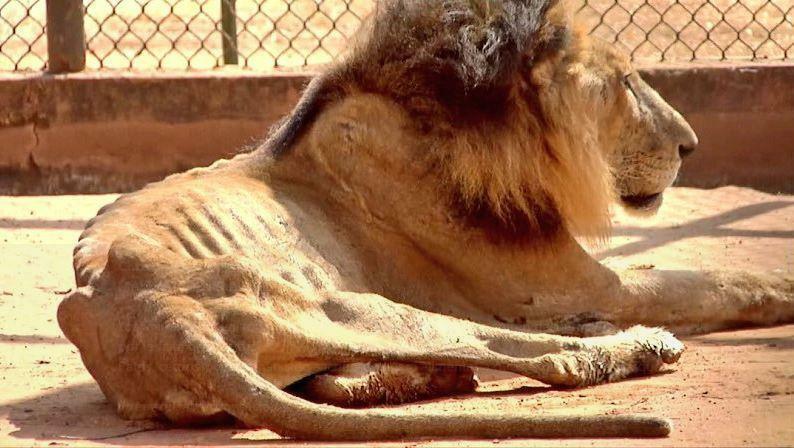 An emaciated lion in a zoo in the Venezuelan state of Zulia. Image by Christian Veron on Twitter. One aspect of Venezuela’s food crisis involves problems at its zoos. An attraction for the country’s urban public and tourists in better times, zoos have in recent years been scenes of horror, as reported by the local press and echoed in international media. In August 2017, a keeper at Zulia Zoo near Maracaibo reported that animals had attacked each other for lack of food. Other animals were apparently slaughtered by the keepers to feed the facility’s carnivores. Thefts have been rife at the same zoo. Forty animals have been reported stolen, likely to be killed and eaten. Vietnamese pigs, monkeys, macaws and redfish were taken at night. Some robberies involved endangered species including tapirs. Two peccaries, a type of wild pig, were stolen, while buffalo were butchered on site. Similar stories have been reported from other Venezuelan zoos: Peacocks and other captive birds were the victims of hungry thieves who raided Bararida Zoo in Barquisimeto, 250 kilometers (155 miles) southwest of Caracas. Several men dismembered a horse inside the Caricuao Zoo in Caracas, the capital; tapirs, sheep and rabbits have also been stolen from there. While not a case of wildlife abuse, a viral video on YouTube shows people entering a pasture and beating a cow to death. 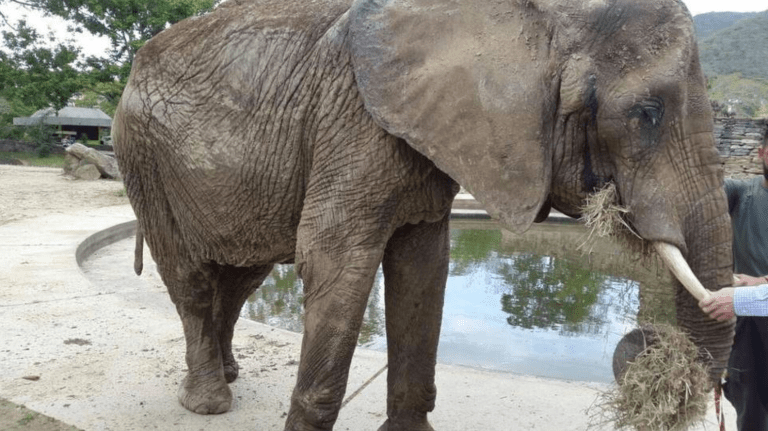 Investigations have been opened in all of the zoo cases, but no one has been charged. Several zoos, including those in the cities of Mérida, San Cristóbal and Punta Fijo, are collecting donations from local businesses and the public to feed their animals. But as recently as February this year, showed a visibly emaciated puma, along with a severely malnourished lion, Bengal tiger, jaguar, camel, buffalo, a pair of Andean condors, and other animals, according to AFP. Esmeralda Mujica, former director of the Zoo and Aquarium Foundation of Venezuela and a member of the IUCN’s Species Survival Commission, says zoo animals are killed by hungry people living in surrounding poor communities who see the animal collections as a source of food. “This shows starvation and desperation,” she said. The minimum wage in Venezuela is about $3 dollars per hour and unemployment is expected to hit 30 percent this year, according to the IMF. 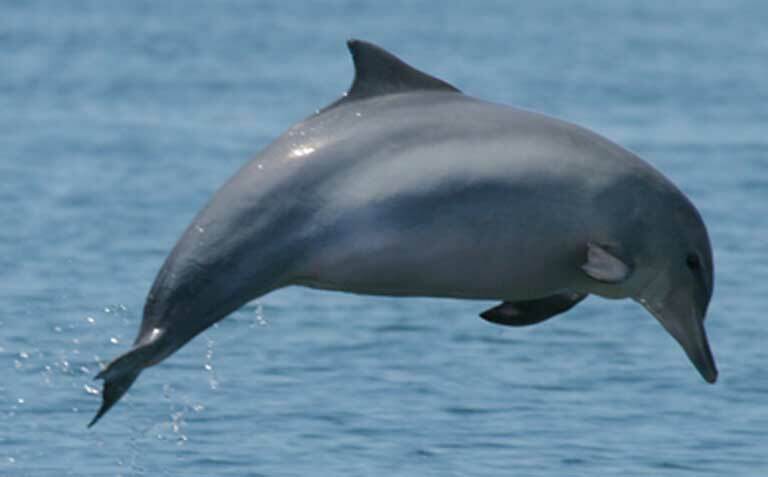 The Guiana dolphin, known locally as tonina (Sotalia guianensis). Image courtesy of Instituto Boto Cinza licensed under the Creative Commons Attribution-Share Alike 2.5 Generic license. The Guiana dolphin, known locally as the tonina, weighs an average of 80 kilograms (176 pounds) and measures 2.2 meters (7.2 feet) in length. It’s found from Costa Rica to Brazil, and in Venezuela’s estuarine waters, including Lake Maracaibo and brackish parts of the Orinoco River. Also known as lake tonina or river dolphin, it is ostensibly protected from commercial trade under the Convention on International Trade in Endangered Species of Wild Fauna and Flora (CITES), and is listed as vulnerable in the Red Book of Venezuelan Wildlife. Yet it’s also apparently being increasingly targeted for food as the Venezuelan economic crisis deepens. In 2016, Yurasi Briceño and Leonardo Sánchez Criollo, researchers from the Venezuelan Institute of Scientific Research (IVIC), undertook an assessment of the relative density of the tonina population in Lake Maracaibo, where they looked at an area covering about 7 percent of the 13,000-square-kilometer (5,000-square-mile) saltwater bay. Briceño reports a definite increase in hunting and trade for human consumption of tonina since 2016, as compared to her original 2007 field research, when scientists recorded 35 catches of dolphins in Lake Maracaibo — more than 50 percent of that was intentional, while the rest was reportedly bycatch. Los Depredadores, the Predators, wildlife traffickers taken into custody by the Venezuelan National Guard. Image courtesy of the National Guard. “In 2016, a criminal gang called ‘Los Depredadores’ [the Predators] dedicated themselves to capturing the dolphin for [the wildlife] trade. They were caught by the police, but that was not the only case,” Briceño tells Mongabay. 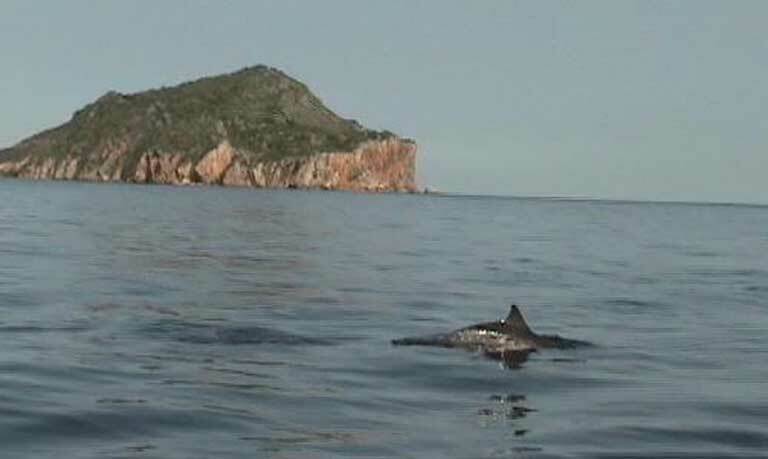 She estimates that recent hunts for tonina in the local area yield as many as three dolphins per day. By comparison, in November 2017 she received reports about just four animals being captured per week. The economic crisis, she says, likely explains the increase. What she is certain of is the capture of at least “one dolphin per week for consumption, and two per month to trade, in the southern part of Lake Maracaibo in 2018.” This is a region where poverty is severe and marine biodiversity is low due to oil spills, causing fishermen to harvest whatever they can find. “They say [that harvested tonina is] bycatch, of course,” Briceño says, adding that it’s difficult to compile reliable comprehensive data from local communities. One recently apprehended wildlife trafficking gang came from Barranquitas, an extremely poor community at the south end of the estuary, where fish catches have declined by 85 percent due to oil spills. “This is the only place we could find chicharrones for sale,” Briceño says, referring to a popular Venezuelan dish usually made with fried pig skin or chicken skin. 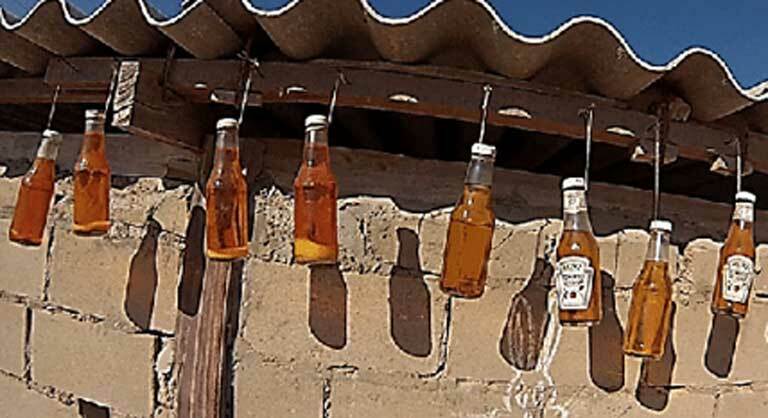 A substitute for these is tonina, sometimes used by caveros, people who buy the fish for sale in the cities. Briceño says that dolphin is also perfect for pastelitos de pote, a very cheap version of empanadas that uses very little meat and a lot of potato as filler. While research is difficult to carry out, Guiana dolphin, or tonina, is likely being harvested at a higher rate since the start of Venezuela’s economic crisis. Image by LuisG67 licensed under the Creative Commons Attribution-Share Alike 3.0 Unported license. IVIC biologist Junior Larreal verified this use of tonina during a recent visit to the island of San Carlos, with its indigenous and traditional fishing communities, north of Lake Maracaibo. One villager there, in addition to providing baggage handling, the rental of beach awnings, and other tourist services, had diversified his offerings to include empanadas de tonina as a delicacy. 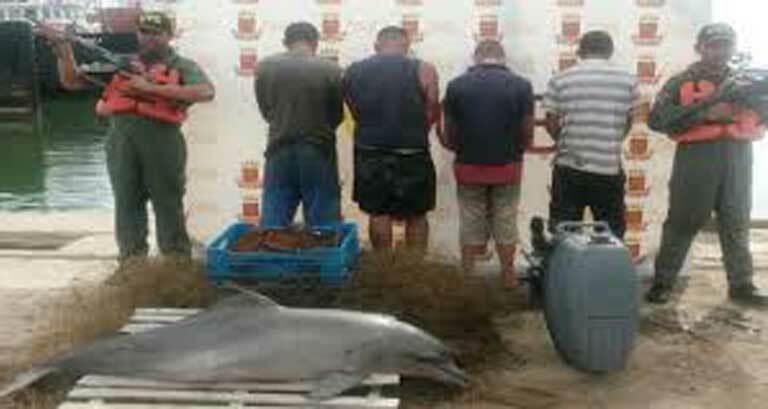 Openly selling illegally caught dolphin had never been reported before. The researcher also collected testimonies from fishermen who received orders from wildlife traffickers for between five and 10 dolphins per week. The question still remains as to precisely how much the pressure on the tonina has increased, and whether it can be tied directly to Venezuela’s food crisis. The dolphin is listed as “data deficient” by the IUCN, meaning that it requires more study. But further research seems highly unlikely in a country suffering from such intense economic chaos. 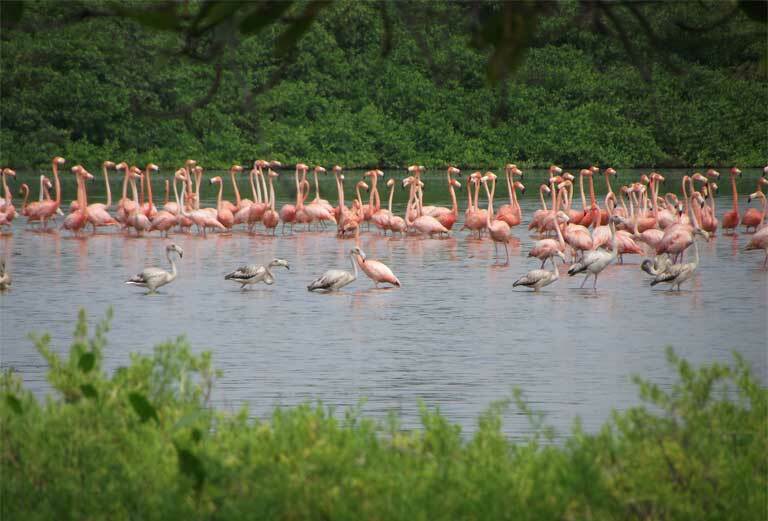 Lagoon of the Peonies is one of three flamingo breeding places in Venezuela. Image by Alexis Quintanillo. The photos, taken by artist Nubardo Coy, show the remains of eight flamingos in the Laguna de las Peonías (Lagoon of the Peonies), a famous haunt of the wading birds north of Maracaibo. Their meaty breasts had been hacked off, leaving only the heads and legs, while their feathers floated in the water. Coy, a professor at the University of Zulia (LUZ), tells Mongabay that locals have a long tradition of hunting and eating exotic birds, including horned screamers (Anhima cornuta) and northern screamers (Chauna chavaria). But the grisly slaughter of the flamingos was unusual. The dead birds were first found by engineer Alexis Quintanillo, who regularly visits the Laguna de las Peonías and uses drones to count the flamingo population and observe the birds’ behavior. “We assume human consumption firsthand as a hypothesis because it is an economically depressed area,” Quintanillo tells Mongabay. His study group has since installed camera traps in the area that have corroborated the presence of hunters. The researchers assume, having not found local nests in the immediate vicinity, that the slaughtered birds flew in from the Ciénaga Los Olivitos Wildlife Refuge, the main breeding area for flamingos in western Venezuela. 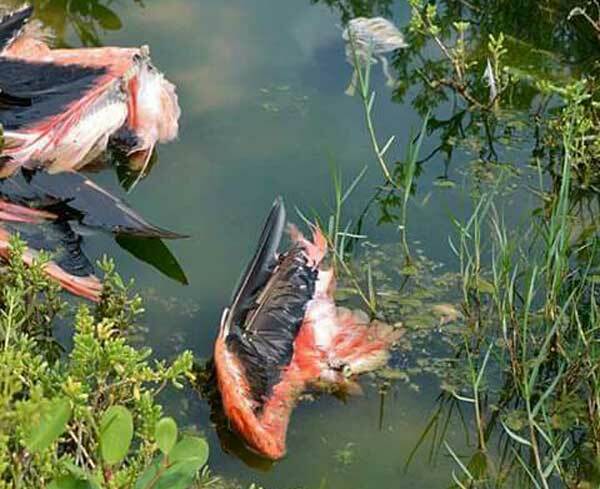 Officials from the Ministry of Ecosocialism and Water, as well as the environmental prosecutors of Zulia, declined to comment on the birds’ deaths. In 2017, Quintanillo visited the same area and found more flamingo feathers, bones and body parts. “Neighbors told me that they hunt and eat the flamingos, and now even raise them. One [flamingo] was rescued [alive from locals], but rejected by a zoo because it lacked the resources to keep the bird,” Quintanillo says. Documenting the slaughter of flamingos in Venezuela. The birds were likely killed for food. Image by Alexis Quintanillo. 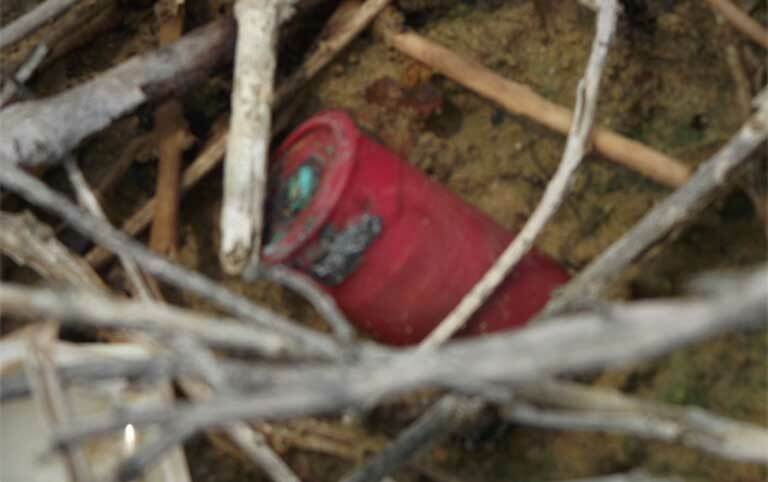 Spent shotgun shell found at the site where the flamingos were harvested. Image by Alexis Quintanillo. The flamingo is not protected in Venezuela, but the birds are valued for their contribution to Venezuela’s tourism industry, which has been in sharp decline since the start of the economic strife. Flamingo populations in the Lake Maracibo area have plummeted due to habitat loss, pollution and hunting. During six months of observation recently, Quintanillo found the remains of 33 birds, as well as 10 dead or dying flamingos, at 17 different locations. Looking back at historical data from 2001 for comparison, he says that during that year’s dry season he found only two injured individuals. Other LUZ researchers have found evidence of the hunting of giant anteaters, and proof that even dogs, cats and pigeons are being hunted in the municipal landfills of Maracaibo, the Miami Herald reported in February 2017. Wayúu indigenous elders have confessed that they sell sea turtles in order to have enough money to send their grandchildren to school. Image by Héctor Barrios-Garrido. Sea turtles have also apparently been marked as prey by hungry Venezuelans, primarily the leatherback turtle (Dermochelys coriacea), listed as vulnerable by the IUCN, and the critically endangered hawksbill turtle (Eretmochelys imbricata). Also consumed locally, but likely in lesser numbers, are the endangered green turtle (Chelonia mydas), the critically endangered Kemp’s ridley turtle (Lepidochelys kempii), and the loggerhead turtle (Caretta caretta), all of which commonly feed and congregate at the north end of Lake Maracaibo. The Wayúu, a local indigenous group, is permitted under Venezuelan law to hunt and eat the turtles, based on their ancestral practices and traditions. 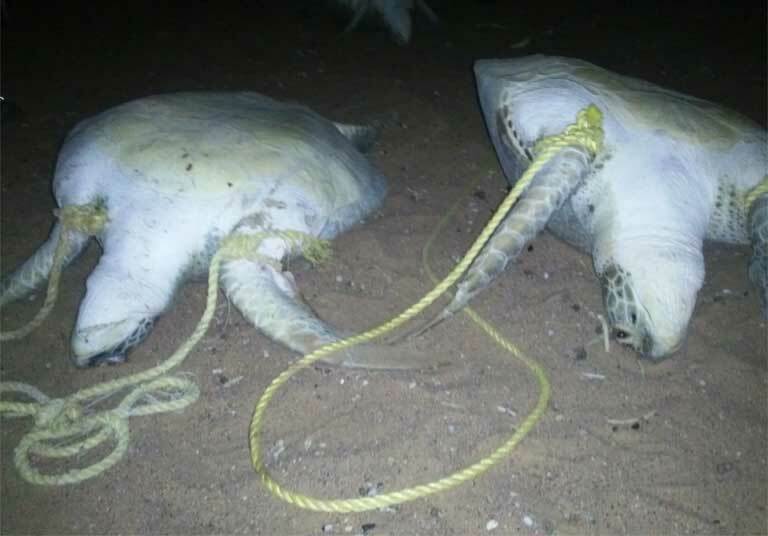 However, the Sea Turtle Working Group of the Gulf of Venezuela has recently registered an increase in this harvesting, as seen in the growing number of numbered turtle plastrons submitted by the Wayúu since 2016. “In a study conducted by IVIC seven years ago, it was estimated that 3,500 green sea turtles were harvested in the area every year,” says biologist María José Petit, the NGO’s general coordinator. Héctor Barrios-Garrido, an LUZ professor, published a 2017 study on the trade in marine turtles on the southwestern coast of the Gulf of Venezuela. The Guajira Peninsula there is the second-biggest turtle harvest area in the Caribbean after Nicaragua. Researchers found turtle meat, shells and other products being sold for between $3 and $150 in 12 Maracaibo markets and two Colombian markets. 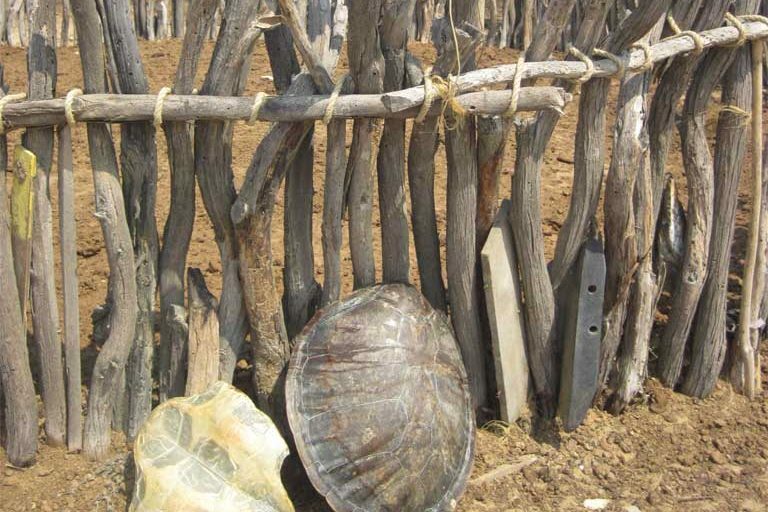 “Wayúu elders confessed that they are selling more turtles [these days in order to afford] to send the children to school,” Petit told the LUZ media. Leatherback turtle (Dermochelys coriacea) oil bottled to be sold or traded. Image by Héctor Barrios-Garrido. Barrios-Garrido says he visited the area in April. “There were a lot of shells there indeed, more than I expected, but it´s only one [data] point. We can´t get any [detailed] statistics that way, but experience makes us suspect an increase in harvesting,” he says. “With an increased National Guard presence on the border with Colombia to fight smuggling, there are now new findings, including the stains of burned shells, destroyed to hide evidence of [sea turtle] harvesting,” he says. In just one visit, he adds, his team found evidence of up to 120 burned turtle shells. “I respect the ancestral and traditional use … but the majority [of turtles killed now are going] to the illegal trade, and we can´t bear it,” Barrios-Garrido says. He also suspects illegal turtle products from the Venezuelan and Colombian Caribbean are being traded to Asia, based on information shared with Colombians researchers. It’s an issue that has also been reported by the Too Rare To Wear campaign in Central America. “In my doctoral study I found 84 harvested caguama [loggerhead], a variety not usually harvested for consumption, but we are now facing general starvation,” Barrios-Garrido says. As with Venezuela’s flamingos, the increase in turtle consumption is impossible to gauge because of the economic crisis. Regular monthly scientific surveys of sea turtle populations have been cancelled since 2016 due to budget constraints, and the true scale of the problem of wildlife harvesting is unclear. The Maduro government continues to refuse international humanitarian aid or recognize that large numbers of the nation’s people are going hungry. Meanwhile, the United States continues to threaten sanctions, seen by many as unhelpful. Amid all this, the plight of Venezuela’s animals has gone largely overlooked. Raul Julia-Levy, an animal rights activist and actor, is now trying to fund and organize an animal airlift from the country’s zoos. Researchers easily found proof of increased illegal harvesting and trade in sea turtles. Image by Héctor Barrios-Garrido.